Cougar sightings have increased 40% in the Park City area according to a report released yesterday by the state DNR. In the last month alone, there were ten sightings in Park City and the surrounding communities of Riley and Dixon. This compares to only twelve sightings for the entire spring of last year. Reasons for the growing number of cougar sightings include increasing encroachment by people into former wildlife habitats and new wildlife regulations that result in decreasing numbers of elk and deer being taken by hunters. 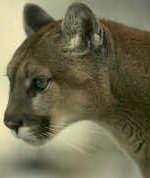 Cougars may be wandering into developed areas, following the herds. DNR spokesman Steve Tasker asks residents to call the DNR report line at 555-6981 if they believe they have seen a cougar or any large predator animal. Two fatalities have already occurred in the west this year from cougar attacks.